As discussed at a previous DEMAND seminar with CIE-MAP, reducing energy demanded by mobility will increasingly require a reduction in the numbers of vehicles in circulation. Car clubs are one route to achieve this where members sign up to access to a vehicle for round trip or one way trips. However, different opportunities exist; OLEV has recently announced funding of Go Ultra Low Cities, Bolloré plans for an all-electric car club in London to launch later this year, and smaller more rural projects in England and Scotland operate electric cars as part of community energy projects. This also opens up questions about how users reconfigure their lives to get used to having access to a car as part of a set of ‘mobility as a service’ options rather than as the default on the drive or kerbside. 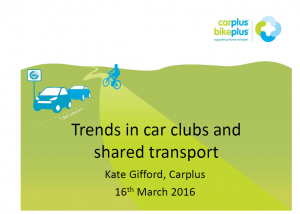 Kate Gifford, Assistant director of Carplus, reviews the evidence about who uses car club vehicles in and outside the UK, why and what for. Carplus is a not-for-profit environmental transport NGO which promotes car clubs and shared transport. Kate leads the management and administration of the car club accreditation scheme and ensures that Carplus meets the reporting requirements of both the Carplus Board and key funding partners, the Department for Transport, TfL and Transport Scotland. Kate therefore brings a unique insider perspective of shared transport and what current trends might mean in terms of future demands on energy and mobility. There is not one form or model of shared car ownership. Two main operational models adopted by car clubs include back to base (used by the majority of car clubs), where a car is spatially fixed and a user picks up and drops off the car in the same location, and the flexible model, which affords significant flexibility, such as drop-off and pick-up determined by a larger geographical zone. Outside of London, flexible car clubs are not currently present in the UK. There are different commercial imaginations of this emerging and yet still some collective and community based models. We don’t yet know much about flexible car club systems rather than return trip systems. Point to point systems work only when the flows in the system don’t require large scale redistribution of vehicles around the network. Flexible car clubs offer an opportunity for users to pick up and drop off vehicles anywhere within a defined zone (but do not require dedicated bays). There are differences between urban and rural environments. Though car clubs and car sharing (eg: Uber) is dominated by larger urbanised cities, it is difficult to know with certainty whether clubs will make greater inroads into more rural areas in the future. Uptake of car clubs will continue to be informed in relation to other trends like Uber and council policies. Some evidence from EU is not comparable with how the London car club market works. There is a tension between slow but steady car club membership, and car clubs choosing to grow their fleets through such fuel technologies like EV, hydrogen and hybrids. For example, surveys have found that users have difficulty with negotiating the EV refuelling and technologies for hybrid and EV compared to traditional fuelling. However, car clubs often perceive growing their commercial fleet with EV and hybrids as a marketing strategy; able to sell the double impacts of reduced car ownership along with more sustainable forms of car travel. Car club members and use of car clubs differ. In the UK, the majority of car clubs and car club users remain in London. As such, users tend to be graduates living in regenerated city locations, millennials in inner suburban areas. Yet, the demographic profile does change in relation to spreading and growth in car clubs. The dominant reason for using car clubs is for a short-term basis (eg: “occasional trip to Ikea”), but also of interest is that 42% surveyed by Carplus mentioned using car club because they can’t make a trip by other modes. 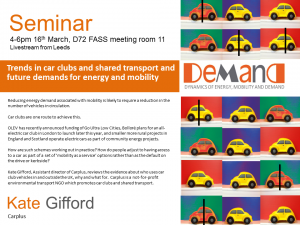 This entry was posted in Seminars and tagged cars, energy demand, seminars, transport. Bookmark the permalink.